NIA CHARLESTOWN NEVIS (APRIL 28, 2016) — Deputy Premier of Nevis and Minister of Health Hon. Mark Brantley recently welcomed the Nevis Island Administration’s (NIA) newest partnership in health with the added services of Neurosurgeon Dr. James Geoffrey Liburd. Mr. Brantley thanked Dr. Liburd for his demonstrated willingness to come to Nevis to contribute to the island’s health care services. According to the Health Minister, Liburd who is a Nevisian who hails from Rices Village in Gingerland but lives and works in Jamaica, will join a number of specialist healthcare providers on the island including internists, cardiologists, paediatricians, and orthopaedic surgeon. 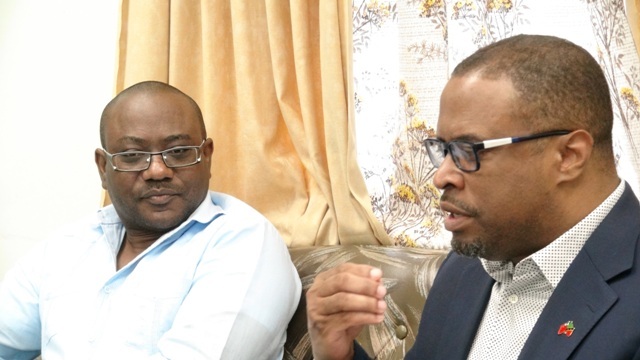 The Health Minister expressed excitement with the new forged partnership which would allow Nevisians to access neurology, citing that health is an ongoing process. He stated that under his watch, as Minister responsible for Health, the NIA continues to fashion solutions that are economically-feasible based on the small population size. “What we have done is, we’ve forged relationships with yourself and with some others who come in from time to time and I am very, very excited and I think the Nevisian public should be excited that we have your skills set now available to us. “Since you’ve been here, you’ve actually done, I believe, our first neurosurgery procedure at the Alexandra Hospital. So to me that’s a major, major achievement and a big deal. We get visiting doctors all the time from all over the world. I think to get somebody coming home is particularly important,” he said. The University of Rochester Medical Center in the United States of America, describes neurology as a branch of medicine concerned with the study and treatment of disorders of the nervous system, a complex and sophisticated system that regulates and coordinates body activities. It has two major divisions – the Central nervous system: the brain and the spinal cord. In response, Dr. Liburd who is the first neurologist from Nevis and one of a few in the Caribbean thanked the NIA and other health professionals at the hospital for their support and for assisting him to return to Nevis to give back to his native land. However, he explained that the frequency of his visits would be dependent of the number of patients. “For now I will be back probably every other month until we have things set up in a way that we can actually do more things here. We have been able to do one operation so far in Nevis and I think that is a real feat to be able to do neurosurgery at Alexandra Hospital. I think it is a big deal. “My stay will depend on how many patients I have to see and this is something that will be ongoing. It’s really a partnership between myself and the Ministry of Health as well as the hospital,” he said.